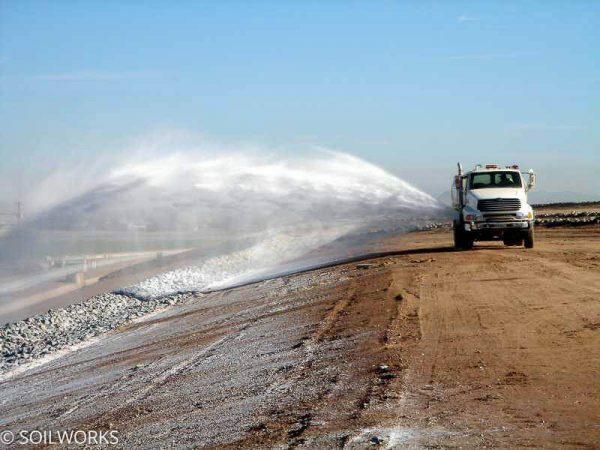 Typical BMPs, such as detention basins, check dams and perimeter erosion controls alone are generally ineffective for removal of colloidal suspension of turbidity from storm water runoff. USDA test data indicates that soil specific polyacrylamide has been a beneficial agent for soil erosion control. Reduced sediment, pesticide and nutrient loading to riparian areas can ultimately be expected using polyacrylamide on construction projects. A basic soil test can determine the appropriate polymer for each job site. Please feel free to call our office to set up a soil test. Note: Dosage-application rates are determined by soil specific testing. Soil polymers and blends should never be used without testing the soil first.